The development of agriculture—the raising of crops and animals for food—has been fundamental to the development of civilization. Farming brought about the settlement of farm communities, which grew into towns and city-states. Farming also made possible sedentary (settled) lifestyles, which in turn led to increased technological development. As growing populations demand an ever-increasing food supply, the need for agricultural advances continues to this day. Agriculture advanced in four major stages that were closely linked with other key historical periods. The first, the Neolithic or New Stone Age, marks the beginning of sedentary farming. Although much of this history is lost in antiquity, dating back 10,000 years or more, anthropologists believe farming arose because of increasing population. The major technological development of this ancient time was the plow. Appearing in Mesopotamia (an ancient region in southwest Asia) around 4000 B.C. 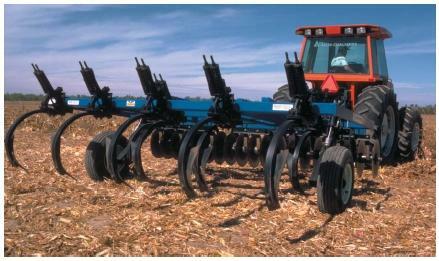 , the plow allowed farmers to plant crops in rows, saving time and increasing food production. The second major advance came as a result of Spanish explorer Christopher Columbus's voyages to the New World in the late fifteenth century. The connecting of the New World and the Old World saw the exchange of farming products and methods. From the New World came maize (Indian corn), beans, the "Irish" potato, squash, peanuts, tomatoes, and tobacco. From the Old World came wheat, rice, coffee, cattle, horses, sheep, and goats. Several Native American tribes adopted new lifestyles, notably the Navajo as sheepherders and the Cheyenne as nomads (wanderers) who used the horse to hunt buffalo. In the twentieth century, maize is a staple food in Africa. Horses drawing a Holt combine harvester through wheat fields in Walla Walla, Washington, at the turn of the twentieth century. productivity, but most important, it reduced the threat of starvation. Without these massive increases in food shipments, the exploding populations could not have been fed and the greatly increased demand for labor by emerging industries could not have been met. As a consequence, the Industrial Revolution introduced major advances in farm technology, such as the cotton gin, mechanical reaper, threshing machine, mowing machine, improved plows, and, in the twentieth century, tractors and trucks. These advances enabled fewer and fewer farmers to feed larger and larger populations, freeing workers to fill demands for factory labor and the growing service industries. Finally, scientific advances of the twentieth century—the refrigeration of meat, the development of hybrid crops, research into genetics—have greatly benefitted agriculture. Great potential exists for the development of crop and animal varieties with greatly improved dietary characteristics, such as higher protein or reduced fat. New World, slave labor was used extensively in farm fields in the eighteenth and nineteenth centuries. In the late twentieth century, the mass production of animals, especially in close quarters, has been extremely controversial. While farmers view new breeding practices as useful means to producing more food, animal rights activists protest them as showing a disregard for animals' comfort and welfare. Additionally, the widespread use of fertilizers, pesticides, and other chemicals in agriculture have led to serious pollution crises in many areas of the world. Famine throughout history shows mankind's desperate dependence on agriculture. Advances in farming, especially in the last few centuries, have led to increases in population. Growing populations—made possible by food surpluses—have forced agricultural expansion onto less and less desirable lands. Because agriculture drastically simplifies ecosystems (communities of plants and animals) and greatly increases soil erosion, many areas such as the Mediterranean basin and tropical forestlands have severely deteriorated. Some argue that the agricultural revolution masks the growing hazards of an overpopulated, increasingly contaminated planet. In the nineteenth and twentieth centuries, agriculture more than compensated for the population explosion. Through scientific advances in areas such as genetic engineering, there is hope that the trend will continue. However, the environmental effects of the agricultural progress could soon undermine any advances if they are not taken seriously. We are two students from Whitehall High School in Whiterhall, Montana. We are doing a report on plows and were wondering if we could use your picture of the nine-cutter no-till farming chisel plow on a present-day London, Ohio, farm. We will cite the picture and make a link back to your website. Also could you tell us who took the picture. Hello... I work for AGCO Corportion. We are putting together an exhibit at our new Intivity Center, located in Jackson, MN, which will include a mention of the first combine harvesters. 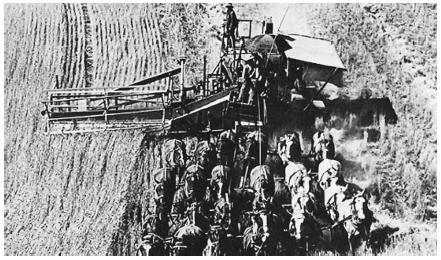 We found your photo, "Horses drawing a Holt combine harvester", on this blog, and would like to use it for our exhibit. However, the image here is far too low of resolution. First, would you grant us permission to use your photo and, second, do you have the image in a larger version? What evidence supports the statement that transitions to food production were gradual and evolutionary? I really appreciate this topic. Would you please tell me the origin of agriculture. How many years each stage lasted for? and where a particular stage started from?